Bouldering requires perfect moves. Difficult and technically demanding moves require bouldering trousers which provide the climber with maximum freedom of movement. If you value functionality and sturdiness but also stylish designs, you should definitely extend your bouldering equipment with bouldering trousers! But climbing walls is not the only purpose you can use bouldering pants for. With their cool and stylish cuts, they cut a good figure as casual trousers as well. So jump into your sporty bouldering trousers and go for the top! What makes bouldering trousers so special? Be it on the rock or in the hall, boulderers have to face extremely difficult challenges, pushing their bodies to the limit. Each move and every step must be spot-on. Therefore, bouldering trousers must have certain indispensable characteristics. The reliability of bouldering trousers depends crucially on their sturdiness. Their material should withstand intense contact with sharp cliff edges or high friction along climbing walls without dissolving immediately. Of course, bouldering trousers should also be comfortable. Bouldering trousers should fit perfectly and don't get in your way while climbing. The pants should not disturb you during complicated moves that demand your full attention. 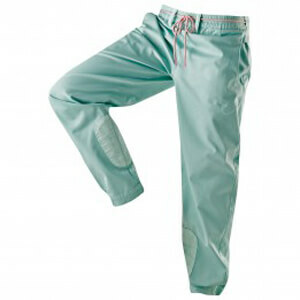 Itching, pinching, or scratching bouldering trousers can quickly become a major distraction. However, probably the most important characteristic of good bouldering trousers is unlimited freedom of movement. Bouldering requires trousers that adapt to the most complicated moves and don't disturb the climber. Bouldering trousers are made of elastic, light materials, and their casual, comfortable cut guarantees unhindered mobility. The generously cut leg width allows you to move your legs freely and even cope with the most complex situations without being held back by your pants. You can also wear a climbing harness on your bouldering trousers. It won't affect you in any way. A soft or even elastic waistband provides a comfortable fit on your hips and a firm grip. Bouldering trousers should also offer sufficient pockets for little things such as keys or mobiles. Many designs come with brush holders. Thus, you can always take your bouldering brush with you in order to clear dirty handles. Their sporty, stylish, and comfortable cut make bouldering trousers an outright eye catcher off the climbing wall as well. Bouldering trousers are always a great choice, be it for relaxed strolls through the city, city trips, or a lazy day off on the sofa.